Chemical Product Design: Towards a Perspective through Case Studies provides a framework for chemical product design problems which are clearly defined together with different solution approaches. This book covers the latest methods and tools currently available in the field and discusses future challenges that the chemical industry is faced with. 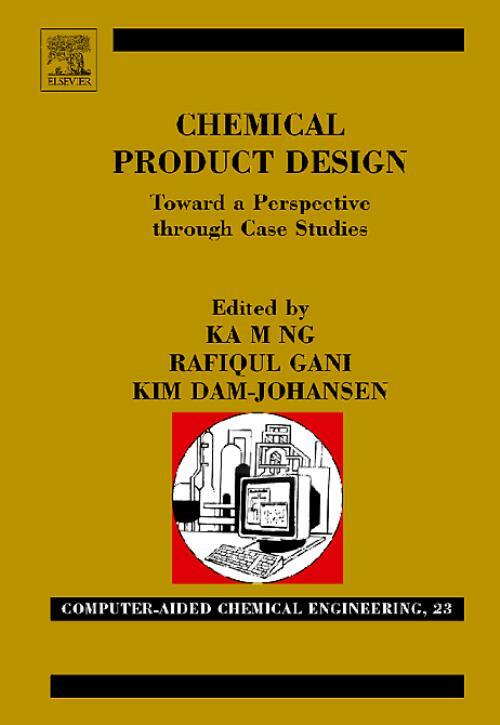 It focuses on important issues of chemical product design and provides a good overview on industrial chemical product design problems through case studies supplied by leading experts. The editors of Chemical Product Design teach chemical product design at graduate level courses and also serve as consultants for various chemical companies. They have also developed experimental techniques for chemical product design as well as computer-aided design methods and tools. 1. Introduction to Product Design (R. Gani). PART I: Molecules 2. The Role of Crystallisation and Solubility Modelling in the Design of Active Pharmaceutical Ingredients (P. Crafts). 3. Computer-Aided Molecular Design Using a Linear Group Contribution Method for the Prediction of Pure Component Properties: Application to Solvent Selection (L. Constantinou et al.). 4. Solvent Design for Crystallization of Pharmaceutical Products (A.T. Karunanithi, L.E.K. Achenie). 5. Design of Liquid Enzyme Products with Built-in Liquid Detergent Stabilization System (P. Bach). PART II: Structured/Multicomponent Products 6. Process Synthesis for Structured Food Products (F.M. Meeuse). 7. Marine Biofouling Protection: Design of Controlled Release Antifouling Paints (S. Kiil et al.). 8. Product-centered Process Synthesis and Development: Detergents (H.K. Fung et al.). 9. Design of the Dove® Beauty Bar (M.I. Hill, A.J. Post). 10. Epitaxial Silicon Wafers Using Plasma-enhanced Chemical-Vapor-Deposition (T.R. Sinno, W.D. Seider). 11. Design of Industrial Catalysts (K.A. Christensen). 12. Entrepreneurship and Product Design in Chemical Engineering Education (K.L. Yeung). What to Make, and How to Make (K.M. Ng et al. ).